Optimizing city development choices is an essential challenge for the future, driven by the growth of world population increasingly living in cities and the opportunities offered by technological innovations. A global system science and complex systems approach, proves essential to conceptualize in a clearer way and predict more realistically the complexity of city evolution. It is essential in solving future challenges by seeing the both whole picture and details, and not only a limited view. Cities are complexly defined by the interaction of processes as different as real estate, transportation, economy, society, and politics, which need to interact in the model. These processes occur at different scales, going from individual transport and real-estate choices, to institutionally defined public transport offer adaptability, and from hourly traffic congestion to long term city development. These processes can prove non-linear and difficult to predict. By its global scope, involving many processes of different nature and at different scales, including the difficult-to-predict human free will, global system science has high specific computing needs, which might benefit from the HPC resources. It concerns particularly data pre-processing and post-processing and model simulation: refining one simulation or running many simulations. We’ll present the results of the city pilot and put into light this multi-fold synergy corresponding to three steps of GSS modelling. Firstly, model design, by finding the appropriate agent and data granularity. Secondly, model scenario exploration . 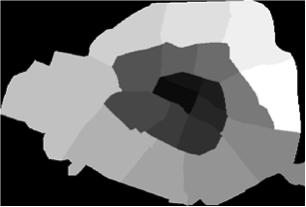 Thirdly, seeking further results analysis and insights over simulation results’ post-processing. The global urbanization pilot aims at studying the two-way relation between transport infrastructure decisions and price mechanisms, particularly concerning real estate. We chose Paris as use case. The simulations are based on open data, such as the average real-estate pricing per district in Paris (Figure 1). Here after figures showing the principles of the pilot. Finding the appropriate data and agent granularity. Firstly, we find the appropriate data and agent granularity. 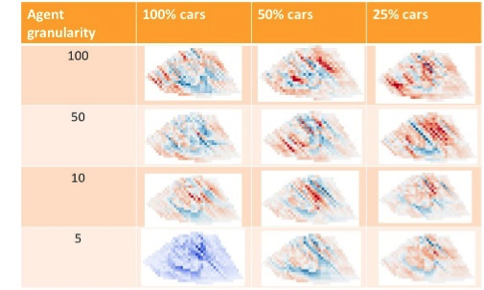 We calculate the difference between results with different initial data granularity, while varying agent granularity and a key parameter (the transport scenario). Figure 3. Difference maps of simulated real-estate prices: Investigating the influence of agent granularity and key parameter on the difference observed between simulations with different initial data granularity. More precisely, figure 3 shows 12 sets of results: every map represents the difference of real estate prices between simulations initialized either with fine-grained (interpolated), and coarse-grained (district) real-estate prices; red is a negative difference, blue is a positive difference, and the intensity indicates the value (pale close to 0). If the basic difference is calculated following the data granularity, we additionally vary the agent granularity (i.e. how many humans every agent represents) (lines) and a key parameter, the initial number of car commuters (columns). We seek to find out whether the difference changes with them, i.e. whether the impact of data granularity varies following the case. 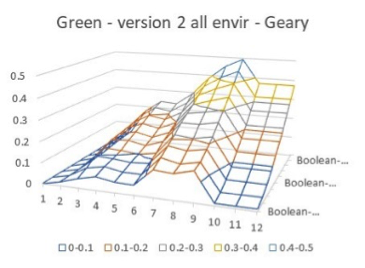 We can see that the difference value varies significantly not only following the agent granularity, but also following the value of a key parameter (defining the initial transport mode choice) in a non-trivial way. This calls to get further insights we calculated. We finally choose the finest data and agent granularity. Once the data and agent granularity decided upon, we secondly explore the model. Increasing the level of ecological awareness, by concerning every commuter, allows to change transport mode choices and decrease therefore significantly the level of pollution. Public transport adaptability plays also a positive, yet less important, since to targeting unequally areas following their present level of public transport. Figure 4. Observed of pollution following ecological awareness and public transport adaptability. 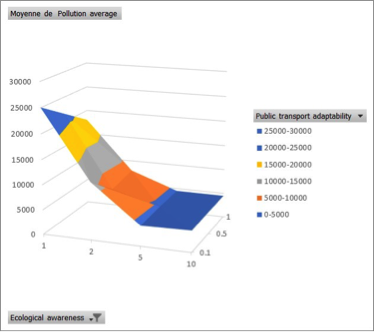 Furthermore, when studying more precisely the influence real-estate price mechanisms, we can see that prices influenced mainly by pollution lead to higher percentages of commuters choosing public transport than prices influenced mainly by public transport offer; the scenario where prices are influenced both by the public transport offer and pollution leads to intermediate values. Exploring the parameter space requires thirdly to assess precisely the simulation results, while clarifying their implications. This study illustrates the possible benefit of HPC for GSS by facilitating the post-processing of data to find new insights. In the following figure we show the time evolution of spatial heterogeneity of green commuters. Calculating this spatial heterogeneity shows how green commuters vary spatially. Homogeneity would mean green commuters percentages are similar everywhere. Typical heterogeneity would be sharp differences in green commuter percentages between adjacent spatial cells. Here there is spatial heterogeneity, since living in a place with good public transport offer (which shows some spatial heterogeneity) increases the probability of becoming a green commuter. We further observe how it evolves with time. The heterogeneity first increases with new green commuters reflecting the heterogeneity of the initial public transport offer. However, the increase in the demand leads to develop public transport offer, which becomes spatially more homogeneous, leading to new green commuters, the map of which becomes then more homogeneous too. Furthermore, the heterogeneity observed increases with the size of the neighbourhood considered (depth horizontal axis), showing that heterogeneity don’t even out at larger scale. We study a city model, while investigating different possible forms of synergy between GSS and HPC. We have studied the influence of parameters on transport mode choice and consequently on pollution, from individual ecological awareness to institutional public transport offer, and its adaptability to demand. Pollution impacts itself real-estate pricing, depending also on public transport offer. To summarize, even if their specific influence varies, the more observation and adaptation mechanisms (commuters with ecological awareness, real-estate influenced by pollution, public transport adaptability) are present in the model, and the easier it will resiliently respond to high levels of pollution to help reduce it. Furthermore, we have shown, with city pilot examples, various possibilities of synergy between GSS and HPC. The meeting between GSS and HPC opens to new challenges and possibilities.